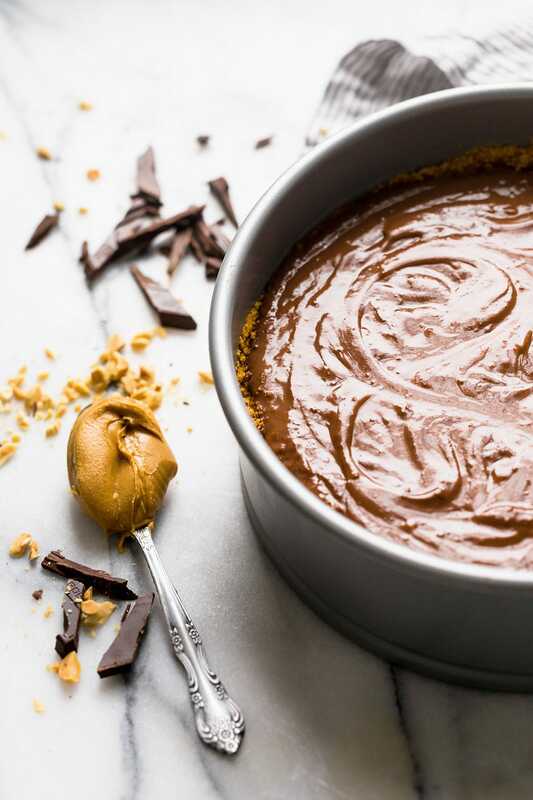 Chocolate Peanut Butter Pudding Pie tastes like a giant Reese’s peanut butter cup but so much better because it’s made with thick and creamy pudding! This pie won’t last long!! Taste: Like a Reese’s peanut butter cup but with more unadulterated chocolate and peanut butter flavor. Texture: The texture is my favorite part of a pudding pie, it’s what I crave. 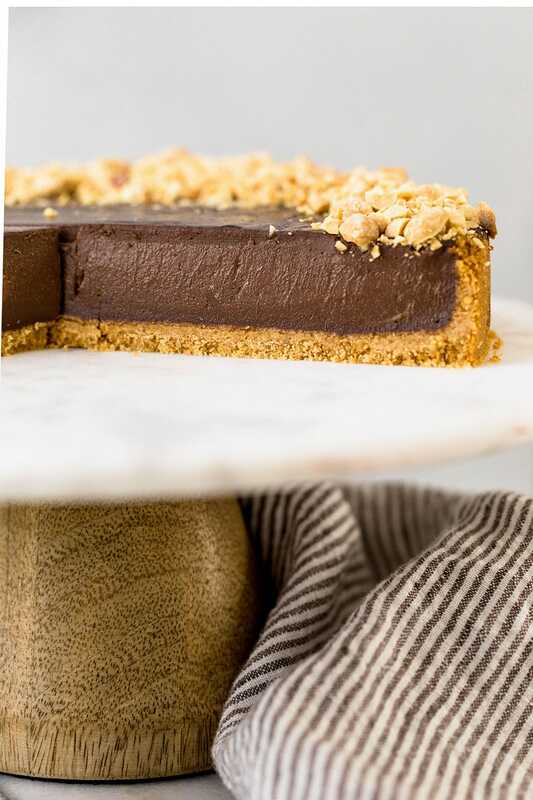 I just love that thick, creamy, luscious pudding paired with the buttery crunch of the graham cracker crust. Ease: Surprisingly easy, just get ready to spend some time babysitting the pudding on the stove. 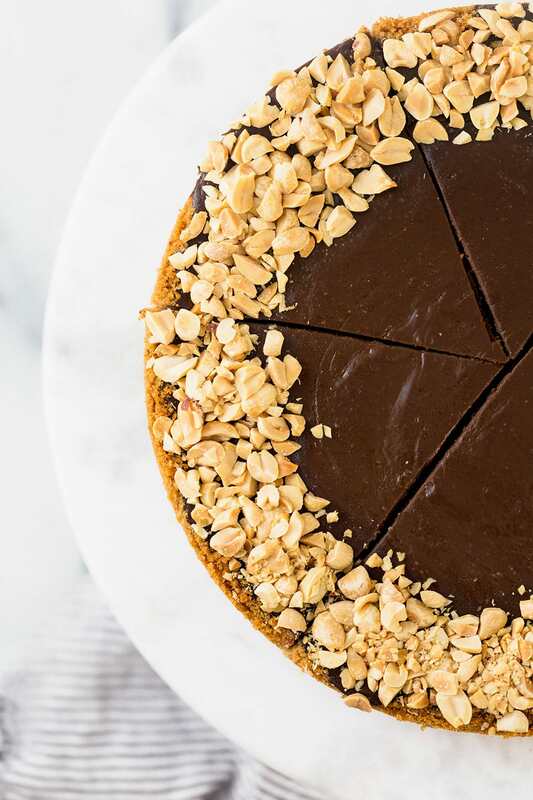 Pros: Adding peanut butter to one of my all-time favorite pie recipes made me VERY happy. Cons: The pie has to chill before being served which is pure torture. Would I make this again? I’ve made variations of this recipe more times than I can count. There have been many strange and ridiculous food trends in recent years. Lately in the blog world an ongoing trend has been adding crazy ingredients and twists to classic recipes. That can be fun and fine, but sometimes I just want to enjoy the classic tradition of a dessert. When creativity is added in only for the sake of creativity, it doesn’t even taste good half the time! Sometimes I just want to enjoy the simplicity behind what made it a classic in the first place. Not bombarded with different and new tastes and textures for the sake of novelty. It’s funny because I do not consider myself a food purist at all, but I suppose I just haven’t gotten bored with my favorite recipes just yet. Chocolate pudding pie has been a favorite of mine since childhood. It was one of the first pies I learned to make when I became interested in baking. While I’ve made some variations of it, I almost always prefer the standard recipe. That was until I created this peanut butter version. 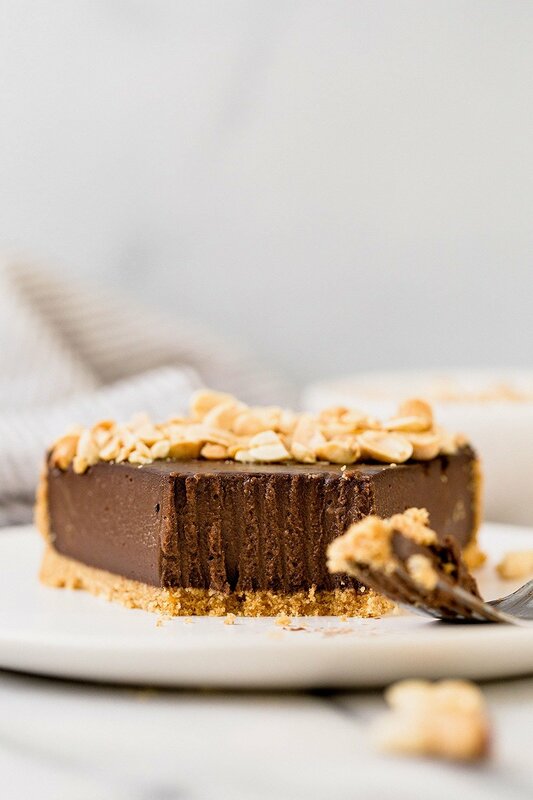 I think the reason I adore this Chocolate Peanut Butter Pudding Pie so much is because it maintains the texture of a classic pudding pie while adding a whole new level of deliciousness. I am such a texture person, so this means everything to me! 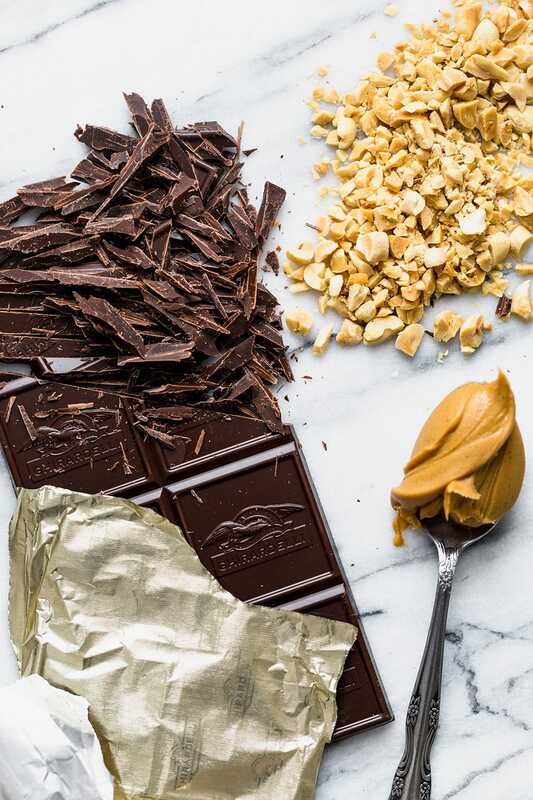 Of course I’m also a huge chocolate + peanut butter person. So needless to say this pie all but vanished in our house. If you’re anything like me, it won’t last long in your house either! Plus it’s actually pretty simple to make and you can use lowfat milk so there’s a little less guilt too. For the crust:Preheat the oven to 350°F. In the bowl of a food processor pulse the graham crackers and sugar until finely ground. You should have about 1 3/4 cups. Add the butter and pulse until moistened. Use the bottom of a measuring cup, glass, or ramekin to press the crust mixture into the bottom and up the sides of a 9-inch pie plate. Bake until fragrant and golden brown, about 12 minutes. Cool completely on a wire rack. For the pudding:Put the gelatin in a small bowl, add the boiling water and stir until dissolved. Set aside. Remove from the heat. Add in the peanut butter and chocolate and stir until melted. Stir in the vanilla and reserved gelatin mixture. Pour the pudding into the pie crust. Garnish with the peanuts. Chill the pie in the fridge for at least 3 hours, or preferably overnight, until well chilled and set. Slice and serve! This post was originally published in 2014 and updated with new photos and recipe tips. Photos by Jess Larson. This looks incredibly rich and creamy and delicious! Do you recommend using Skippy-type peanut butter over natural peanut butter? I’m wondering if there would be a textural difference in the pie depending on whether a baker were to use the more processed pb vs. the more natural. I used a “natural” peanut butter but one that doesn’t require stirring. As long as there’s not an excess of oil in the peanut butter you add to the recipe it should be fine! May the peace, mercy and blessings of Allah be upon you. Actually, I would like to ask about using Gelatin (I cannot use it). Can I replace it by something else? I have another question (Sorry) is about the difference between the white sugar and the light brown sugar? May Allah reward you (with) goodness. I can’t wait to make this. Can I just use chocolate instant pudding mix, then add the peanut butter to that? It’s all I have in the house. I’ve never tried that so I can’t say. Can you substitute the milk for a dairy free substitute such as soy or almond milk? The consistency of the chocolate batter looks incredible!! I just tried to make this using dark cocoa and bittersweet chocolate because they were what I had on hand. Big mistake! Ick the filling was AWFUL! I tried adding more sugar, but then I think it got too sweet so I tried adding some instant coffee powder. I eventually gave up trying to fix it and just poured it in the crust. I’ll slather it in whipped cream and cross my fingers! Wonderful idea to make a delicious cake. Will make it soon. Thanks for this idea!